If you know me in real life, you probably know that I did a lot of "research" while I was pregnant. I really wanted to be prepared for this baby, and the only way I knew how was to read lots of books and ask lots of questions. I asked questions of our obstetrician. I asked questions of my friends who were already parents. I asked questions of my family members. I asked questions of the lady in the checkout line at the supermarket. My life was one big question mark. Who was this baby growing inside me? What would he be like? Would he have his Daddy's sense of humor? My curly hair? Would we have any clue how to take care of him??? Now that Jack is here, I realize that all of the book reading and question asking probably didn't hurt; but really, there's just no way to prepare for the changes that come with becoming a parent. Even if someone could articulate what happens when you create a new person, you would never be able to comprehend it. If by some miracle you could comprehend it, I think your head would explode. So it's probably a good thing that there's no way to prepare for it, or people probably wouldn't reproduce. This book is incredible. I had been warned against getting the "What to Expect" books because they were too scary. Apparently, these books basically tell you everything horrible that could happen to your baby, and why it probably will. So, I steered clear and opted for the gentler words of attachment parenting founder, Dr. Sears. I devoured this book while I was pregnant, and have referred to it numerous times since Jack's arrival. My summary of the advice in this book: know your baby and respond to his cues. Pretty simple, huh? Oh, and the book is full of good old scientific facts, information on milestones, and tons of "how to" information. It's the closest thing I found to a "baby owner's manual." This movie examines the struggle we face in America between viewing childbirth as a natural process versus a medical emergency. It looks at hospital births versus home-births, as well as doctor-attended births versus midwife-attended births. The movie does have a strong bias, but it also offers up some eye-opening statistics. Did you know that the United States has the second-worst newborn death rate in the developed world and one of the highest maternal mortality rates in industrialized countries?!? Shocking. This movie prompted me to look into the option of home birth; and while we didn't end up going that route, I credit this movie with providing the impetus to become an active participant in Jack's birth rather than a "patient." 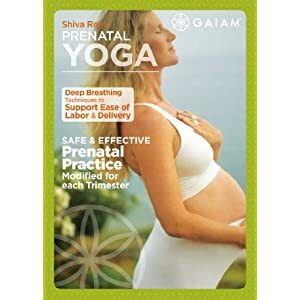 I found a local prenatal yoga group and started going when I was about 13 or 14 weeks pregnant. It was one of the best things I did while I was pregnant. Not only was it great for me and the baby physically, the emotional support was incredible. The class was two hours every Monday night. The first hour was spent sitting in a circle, and each woman got to share her thoughts on the topic of the evening. The second hour was spent focusing on our bodies (doing the actual yoga), and honoring our connections with our little one. I learned so much from our teacher, and from the other women in the class. Plus, now I have a great group of "Mommy" friends, and Jack has a ton of little yoga baby friends! I also purchased the Shiva Rea DVD and did that a few times at home. Good stuff, the yoga. Highly recommend it. Massage. Lucky for me, my mom owns a salon. I was able to get a great prenatal massage about once a month. I did 90 minutes, but even if you can get in for a 30 minute massage, do it! Just make sure you check with your doctor or midwife before you schedule your appointment. There are a few contraindications. Better safe than sorry. What are some of the things that you did to prepare for your little one? Are there things your wish you had or hadn't done? "Natural Childbirth the Bradley Way" was probably the most useful book I read. It really got me (and my support team) ready for birth and we used a lot of the techniques during labor. I also liked the more 'how to' have of "Ina May's Guide to Childbirth" -- I really didn't get into the birth stories. If I had it to do over (or if I do it again), I would definitely get more exercise during pregnancy and I'd especially work on my squats form day one. Squatting was by far the most effective pushing position I tried, but it would've been a lot easier if I had built up those upper leg muscles. I also felt like I spent so much time reading about/preparing for pregnancy and labor that it didn't occur to me to read about what to do *after* the baby's born until the last minute. I ended up trying to speed through the the Sears Baby Book and breast feeding information during the last few weeks when I had planned on doing Hypnobabies. If I do it again, I'm definitely starting Hypnobabies earlier.